I love defense games. Many times, it’s all about what unit to dedicate your resources into, what order you create them, and how you upgrade your defenders. Tower defense is the most common and Crystal War takes the warriors of the medieval age and sends an army of green goblins (no Spiderman relation), Orcs, and Balrogs to battle for the sake of Middle Ear—er… this world! This RTS Defense game is released by GNC Interactive on the iPhone, iPod touch, and iPad for $0.99 with a free alternative. To start, the art style is absolutely great. Deep, well-illustrated, incredibly detailed and layered background environments, the characters have a Fire Emblem/Castlevania style with the dark black outline and the mostly solid coloring. The art for the map screen shows depth and just enough detailing to make it grand and feel epic. The interface is well don and the text is appropriate and legible. It feels like a full game that would be released on the PSP or DS. The scale of the characters and just how many you can push out into the fight is pretty amazing. All the different unit types swarm the field and their little health bars get torn to shreds. 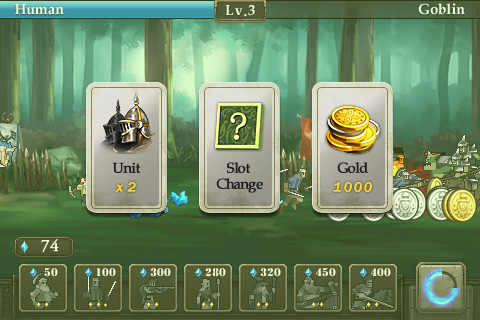 Once in a while, a coin will drop so you will have to collect them in order to upgrade your units. All an all, you just press the unit-spawning images to spawn them if you have the resources to pay for it. In the human side, you get access to a soldier unit that is free. Trust me, when you aren’t tapping the field or making costly units, this free unit button is being spammed like there’s no tomorrow. The goal is to make Mining units, gather materials while spamming your soldiers, and making sure to summon stronger units every once in a while. You have to kill your opponent’s chief while defending yours. The chief has a massive amount of health so don’t ever stop creating units. 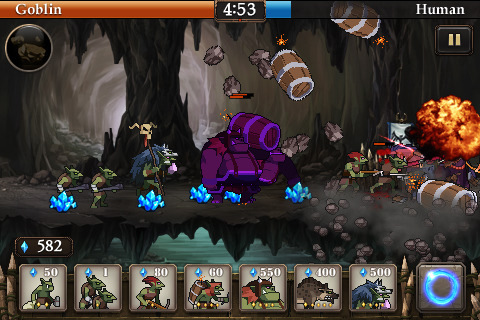 Crystal War gives you a variety of different of combating your enemies. Gather enough money to buy new units. Gather enough power and you can trigger huge attacks like a volley of arrows, spreading a disease, or even casting a giant black hole into the field! 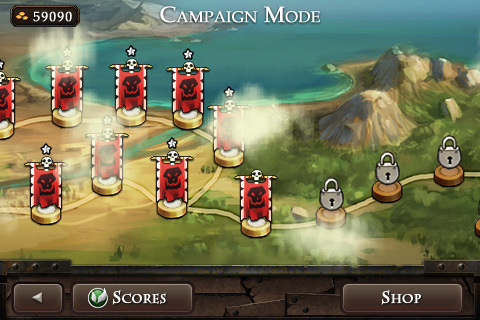 In the latest endless mode, you get special cards that can bring you more units, gold, or options. This is a vast game with tons to do. I was surprised how fun it was to actually replay stages multiple times in order to gain more gold. Completely dominating your opponent is, again, fun. Everything that Crystal War executes was executed extremely well. Nothing stands out as being flawed during my experience and checking out all the different background art made my day. Because of Crystal War’s very stylish art, deep and structured unit upgrading system, multiple user-powers, an endless mode, and being able to play the game in a completely different way via the Goblin story mode, this is a high production game app and GNC Interactive should be proud. I enjoyed this game immensely. I demand spinoffs!! AppSafari review of Crystal War was written by Joseph Ho on October 27th, 2010 and categorized under Action, App Store, Featured, Fun, Games, Resource Management, RPG, Strategy, Tower Defense. Page viewed 4785 times, 4 so far today. Need help on using these apps? Please read the Help Page.